This product is not sold or intended for the purpose of application as described in the product description. Any information provided about this product on this website, including any links to external websites, are solely intended for historical, scientific and educational purposes and must not be interpreted as a recommendation for a specific use of the product. The statements contained herein have not been evaluated by the Food and Drug Administration and the product is not intended to "diagnose, treat, cure or prevent any disease." The use and application of this product, based on the historical and scientific context provided in the product descriptions and articles, is solely at the customer's risk. This product is a specimen of ethnographic value and interest only and is delivered with no express or implied fitness for any purpose. The product descriptions are compiled from sources we deemed to be reliable up to the date it was written but may contain omissions or errors in fact, or become outdated. It outlines the documented history of uses but should no way be construed to make any medical claims about the ability or efficacy of any of this item to treat, prevent or mitigate any disease or condition. Although it may have a long history of being used for a particular purpose, scientific evidence proving its efficacy for that purpose may be lacking. Never use Kambo without professional guidance! Sapo (toad), Vacina do Sapo (toad vaccine), Leite do Sapo (toad milk), Kambô, or Kampú, Secretions of the Phyllomedusa bicolor treefrog. A Kambo Stick is a small wooden stick, with on its surface the dried secretions of a bright green tree frog called the Phyllomedusa bicolor. "Kambo", "Kampo" or "Sapo" is a traditional medicine used by Amazonian tribes indigenous to the western Amazon region. The Matses tribe traditionally uses this medicine to obtain strenght, aim and dexterity for the hunting. The utilization of this frog venom is shared by numerous other Amazonian tribes, including the Matis, Kanamari, Kaxinawa, Katukina, Kulina, Yaminawa, Marubo, and Ticuna tribes. The dried secretion contains up to 7% potently active peptides - phyllocaerulein, phyllomedusin, phyllokinin, dermorphins (selective mu opioid receptor agonists) and deltorphins (selective delta opioid receptor agonists). Phyllomedusa bicolor, also known as the Giant Leaf Frog or the Giant Monkey Frog, is a large green noctural frog that lives in the trees of the Peruvian and Brazilian Amazon. Males 91-103 mm, females 111-119 mm. The dorsum is dark green and the belly varies from white to yellow-white or cream. There are sparse white spots with dark frames on the lower lips, chest and front legs, and these are more dense on the flanks and hind legs. Fingers are transparent brown with large green adhesive discs. A prominent gland extends from behind the eye over the tympanum. The iris is dark gray. The species is arboreal and nocturnal. Males usually call from high trees, and descend with the female to construct nests 1-3 m above ponds. Reproduction occurs throughout the year in ponds near to, or far from, streams, with a peak from November to May (rainy season). The females deposit about 600 unpigmented eggs in a gelatinous mass in leaf nests hanging over ponds. The leaves are joined or folded with the aid of the male. After 8-10 days, the tadpoles hatch and fall into the water, where they complete development until metamorphosis. Like other amphibians from around the world, the giant monkey frog is threatened by climate change and habitat loss. Very healing. Excellent Kambo. Very strong. Kambo is not a pleasurable experience, it can be very difficult physically and emotionally but the benefits of this medicine make the discomfort well worth the reward. I have taken twice Kambo and it really works. How can i keep the stick fresh? Still got many dots on it. They are fresh, powerful, and each stick will provide a practitioner with enough material to inoculate a minimum of 10 people. These are simply the best, most potent Sapo/Kambo sticks available. 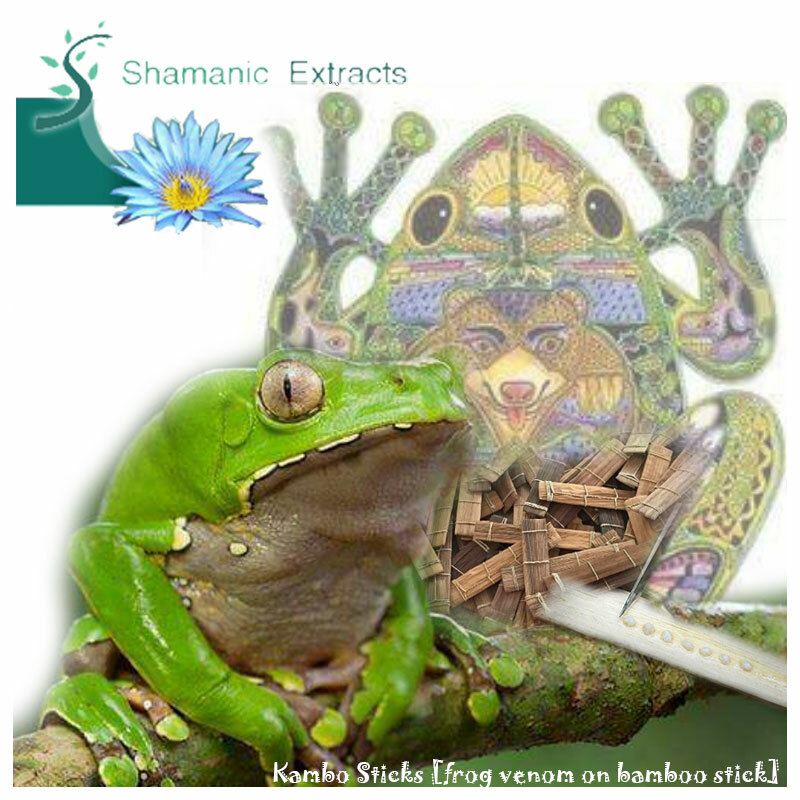 Share your experience about Kambo Sticks - frog venom on bamboo with other customers. Submit your tips or thought on this product, be detailed and specific.